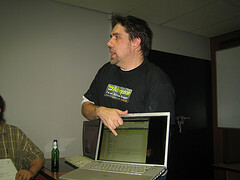 These are some of the thoughts I shared at the Drupal Johannesburg meetup held on 11 March 2009. For me, it was great to see everyone again, although I was disappointed that there weren't more than 3 new faces among the 15 or so that turned up. We do need to do something to attract more new members. I particularly enjoyed hearing about what new modules people have discovered, and enjoyed the less formal discussions afterwards. Acquia have released an all in one Drupal install which includes Acquia Drupal, Apache, MySQL, PHP, PhpMyAdmin, and an Acquia Drupal Control Panel, to allow users to easily test and play around with Drupal, without having to get into the technical details of installing separate instances of Apache, MySQL, PHP etc. Drupal web developers, or anyone in fact wishing to learn more about Drupal would be well served checking out the videos from the latest Drupal conference "DrupalCon DC 2009", available at the Internet Archive. Was getting irregular "500 Internal Server Error" pages on a new Drupal 6 install, running on shared hosting. In 2008, the Weill Cornell Medical Library made a case before its administration to use Drupal, the popular open source content management system. KAYA FM interview: DISCOVER MORE- THE BUSINESS OF BEING ONLINE. 1) What are some of the main things small businesses need to consider when looking at setting up a website? I really think the most important aspect of setting up a web site, is planning. Think how a house is built – you don’t jump straight in and start building – No. You first think about the ideal house that you want, and then develop the plans for that house, based on your specific needs and your financial situation. It’s exactly the same with building a website. Read more about KAYA FM interview: DISCOVER MORE- THE BUSINESS OF BEING ONLINE. The third Drupal Johannesburg meetup took place on the 19 July 2008 at Obsidian Systems, and was well attended, by around 25 people (I didn't count, just guessing). While we are still feeling our way around the structure of these meetings, this month's meetup was a step in the right direction. Andre from Cerebra gave a workshop to demonstrate the power of Drupal's CCK module. During the workshop he created a site which allows users to post reviews of cell phones. Some of the modules he used were: contemplate for quick theming of content type data - we were warned not to leave the generated code in contemplate, but to then create a node template and paste the code there, as this is more maintainable because it's not stored in the database. He used the automatic node titles module (plus token) to create useful, and search engine friendly titles. Planet Drupal aggregates drupal related blog posts from a number of drupal sites and bloggers. I've only recently discovered it, but have already found some incredibly useful drupal posts here. For example, this one shows you how to allow "everyone, including “anonymous users”, to be informed of updates to nodes right inside their content", something very similar to what a client has just asked me to do.